Obsolete Studios is a space for collaboration, performance, experimentation and exhibition. We are particularly interested in the paradoxical relationship of obsolescence and contemporaneity, using traditional technologies or found images to generate new thinking and creative engagement. Obsolete Studios are co-directed by Rob Ball and Karen Shepherdson and will be curating the 2014 summer season at The Old Lookout, Broadstairs. Previous exhibitions have taken place at The Pie Factory, FORMAT Festival and Turner Contemporary. During the past 4 years Tim Jones, Senior Lecturer from the Department of Media, Art and Design has been carrying out research on amateur film-making in the local area. He has discovered a number of collections of films showing the Canterbury district in the 1920s and 1930s.” When I started this research I was expecting the amateur films to be of poor quality. Often when you think of amateur filmmaking you think of wobbly camerawork, babies on the lawn and boring holiday films. However, I’ve been really amazed at the quality and professionalism of many of the films that I’ve discovered.” One of the most exciting discoveries was a collection of 72 films made by Sydney Bligh. He made newsreels of Canterbury during the 1930s, many of which were in colour. These now represent a unique record of life in Canterbury before the war. Highlights of which include film of T.S. Eliot when ‘Murder in the Cathedral’ was first performed. There is also film of Count Zborowski, the millionaire racing driver who was the inspiration for Chitty Chitty Bang Bang. This 1924 amateur film is a drama made in the style of silent films of that era and features the 15 inch gauge railway that ran for a mile around his estate. The discovery of this film was particularly exciting to railway enthusiasts as it had been thought that no photographs or film existed of this railway. Tim gives regular screenings of the films that he has discovered to the local community. These are often lively affairs where the audience participate very actively.” At the screenings I specifically tell the audience that they are allowed to talk during it and shout out answers to any questions I pose. It’s quite common for me to solve mysteries I have been pondering in this way.” The project has also involved the community in other ways. A number of volunteers now spend their spare time cataloguing the films, writing detailed descriptions into specialist software. Kate McLean is a graphic designer who brings to her work and discipline a deep awareness of the environment by highlighting the multi-sensory nature of human understanding. While the visual tends to dominate graphic design, no single sense operates in isolation. McLean believes that design can – and should – be multimodal, incorporating each of the five senses we possess. Smells form part of our knowing, but are elusive, disappearing before they can be fixed in place. By focusing on olfactory perception, McLean joins a small but growing number of innovative practitioners committed to the study and capture of this highly nuanced, highly personal sensory field. The tools of her trade are simple and effective. Walking through the cities of Europe and North America with a notepad in hand, McLean is led first and foremost by her nose and by a strong desire to discover what makes the places she travels distinct. This process is always collaborative, formed by the observations of local participants and by the relationships that arise from these encounters. On Thursday, April 10, 2014, from 18:30 to 21:30, Smellmap: Amsterdam, an exhibition of McLean’s olfactory exploration of the city, performed in collaboration with Bernardo Fleming of International Flavors & Fragrances (IFF), was on show at Mediamatic, Amsterdam. Presenting the extent of her working process, the display included maps, motion graphics, research notes and sketchbooks, plus a selection of collected smells for visitors to sample. The Dreamland Project provides a visual diary for a photographic research project that records the current state, reconstruction and resurrection of the Dreamland Amusement Park in Margate. Since January 2014, we have been creating a series of unique tintype images as a response to an archive of historical Dreamland images and the space Dreamland inhabits. The second phase of the project will be made on colour film. Each visit will require a darkroom to be built on-site and plates to be prepared, created and developed within the space they are made, often resulting in artefacts from the site physically appearing on the final object. The Old Lookout is used throughout the year for creative workshops and project space. In 2014 the Old Lookout will be joint-directed through Obsolete Studios by two CCCU practice-based academics: Rob Ball and Karen Shepherdson. From June 2014, The Old Lookout is transformed into a Gallery where exciting weekend exhibitions, art events and related workshops take place. This year there is an emphasis on contemporary lens-based practice. Situated in the Harbour Master’s building at Broadstairs Harbour, The Old Lookout offers the University an opportunity to locate artists and the arts right at the centre of this seaside community. Here we have successfully and repeatedly engaged in knowledge exchange. This 18th Century building is a splendidly simple site to exhibit and to use for ongoing creative practice. It is peaceful, low tech and transforming. In its first year (2010), the Lookout welcomed over 8500 visitors within a nine week summer season. In subsequent years the exhibiting seasons have involved numerous creative workshops and events, and nearly 27000 people visited. For the 2013 season not only were there exciting exhibitions and events, but the Gallery was funded to conduct a Social Return on Investment study and develop a toolkit for others to use and benefit from. Magz Hall is currently finalising her PhD thesis entitled: Radio After Radio: Redefining Radio Art in the light of new media technology. Her PhD practice-based research on radio art explores the rich history of radio as an artistic medium and the relationship between the artist and technology, emphasising the role of the artist as a mediator between broadcast institutions and a listening public. It considers how radio art might be defined in relation to sound art, music and media art, mapping the shifting parameters of radio art in the digital era prompting a consideration of how radio has moved from the shared ‘live’ event to one consumed ‘on demand’ by a fragmented audience. I have explored the implications of this transition through my radio practice which focuses upon the productive tensions which characterise the artist’s engagement with radio technology, specifically between the autonomous potentialities offered by the reappropriation of obsolete technology and the new infrastructures and networks promised by the exponential development of new media. A final pre-recorded work, Switch Off (Dead Air) will be realised as surround sound radio art work, incorporating elements from a series of live radio actions, which move towards investigating the tensions at the core of our contemporary understanding of ‘radio’. These have taken the form of 8 fictive trace stations which offer possible futures for FM radio long after it has been abandoned by sanctioned broadcasters. They employ differing types of radio art practice which recall its past uses to focus to focus on its future. I am developing a body of work, which considers issues of radio-as-live-event from a number of perspectives in practice, through broadcast actions, interventions, installations, micro broadcasts and interviews. The trace stations are Radio Mind, Numbers, Lone Broadcast, Sound station, Babble Station, Commercial Breaks, Radio Jam and Radio Recall will each be archived on this blog. 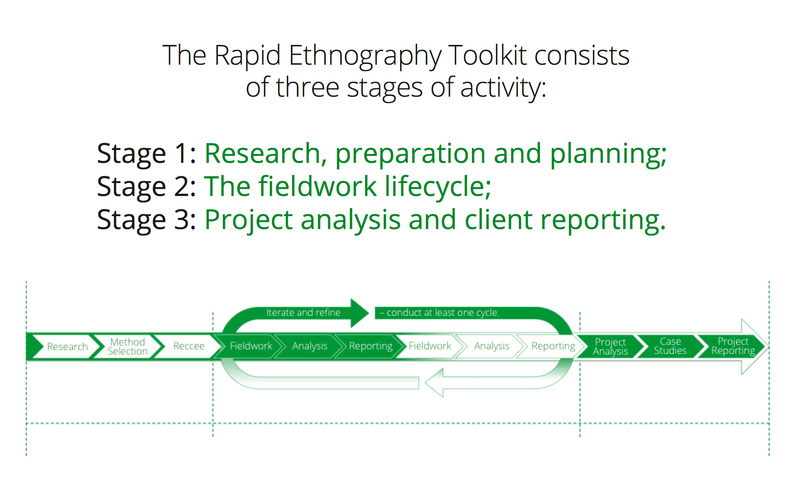 Developing a ‘Rapid-Ethnography-Toolkit’ in collaboration with Europe’s largest User-Experience-Design company, Foolproof, to support the use of qualitative research methods in product and technology development. This is a collaborative research project with Foolproof (Europe’s largest User Experience Design company), which applies the approaches developed during Dr. Meades’ PhD research to new technologies, including mobile phone NFC (Near-Field Communication), and the ‘eighth generation’ of videogame consoles being released in November 2013. This project supports Foolproof in adopting an ethnographic approach to human behaviour research, which is rarely used within product development. These techniques include the use of participant observation methods. Through conducting human-behaviours research upon these technological practices and platforms, combined with time spent working on UXD (User Experience Design) projects from Foolproof’s offices, the intention is to develop a toolkit for rapid ethnography that in turn can be utilised on future commercial UXD projects. This toolkit will build upon Dr. Meades’ existing research experience and methods, but tailored to the language, expectations and procedures of UXD. The toolkit was tested in the field in South Korea exploring the ‘genesis story’ for NFC adoption, leading to fine-tuning of the toolkit and observations to guide technology firms as to how best to support adoption in the UK and Europe. The toolkit will be tailored towards conducting human-behaviours analysis within haptic and interactive entertainment technologies (e.g. gestural interfaces for videogames and smartphones and videogame consoles), and is sensitive to the many differences of research fields e.g. how cultural difference impacts upon adoption (e.g. the differences between NFC and haptic interface use in South Korea and Singapore compared with Europe). This research examines commercial seaside photo-graphic practice from 1860-1980. The exploration offers a visual exposition of the British seaside as represented through the refracted lens of the itinerant beach photographer – also often derogatorily referred to as a ‘Smudger’ or ‘Bodger’. Despite their hum-ble means of production, the photographs are frequently evocative, drawing the viewer into a nostalgic past shaped by visual half-truths. The re-search examines conventions, expectations and mytholo-gisations of what seaside portrait photography should present and how these provide a highly mediated and edited view of seaside experience. My ongoing and long-term photographic project Close to Home attempts to adopt a pers- pective that is at once subjectively ‘at home’ and yet non-subjectively placed at an observational distance. Thro-ugh the medium of instant film (Polaroid) and associated processes such as emulsion lifts and transfers even substantial montages (100 images), remain small and seemingly parochial works. Yet drawing upon the writings of John Piper, Benjamin Britten and more recently Alexandra Harris, I aim to show that with a considered approach, complex layers of meaning in what is ‘close to home’ can be readily and creatively revealed. Shelley Bartlette is urging parents to start talking to their children about the damaging effects of too much loud noise on hearing. Shelley, who developed tinnitus 2 years ago, believes she could have prevented the incurable condition had she been aware of the irreversible affects of too much loud noise exposure. Shelley said “I genuinely didn’t realise that loud noise could be so harmful on my hearing and now I have lost silence forever. I can’t turn back the clock, but I can use my experience to help others avoid tinnitus”. Shelley, who works as a senior lecturer at Canterbury Christ Church University, has recently launched an app for iPhone called Tinnitus Awareness, aimed at parents with young children. Shelley said “I wanted to raise awareness of tinnitus caused by loud noise and provide parents with the facts so they can help protect their children’s hearing for life”. The app is designed to be both informative and fun, in the hope of parents and their children learning about noise levels together. It includes an interactive sound meter that sees a customisable cartoon face change from happy through to sad depending of the noise level. The device also vibrates in the parent’s pocket to warn them where noise levels are potentially damaging and offers advice and guidance. Tinnitus Awareness isn’t about avoiding noise, it is about raising awareness and understanding of noise limits. Parents really can make a difference to the future of their children’s hearing and the earlier they start talking about this, the better.